At Southern Tyres, we are dedicated to serving you. With two depots based in Cork, we supply a large range of tyres for various vehicles. The first Southern Tyres Depot opened in Midleton in 2007. We follow the simple motto of providing great prices and a wide selection of our products. Southern Tyres have evolved with the times and our second depot opened in Blackpool in 2010. Our staff always offer honest advice, quality workmanship, and value for money. Our wide range means we have a tyre to suit anyone’s budget. If we do not have a tyre in stock we will do our best to have it the next day or day after direct from our warehouse which stocks over 10,000 tyres. 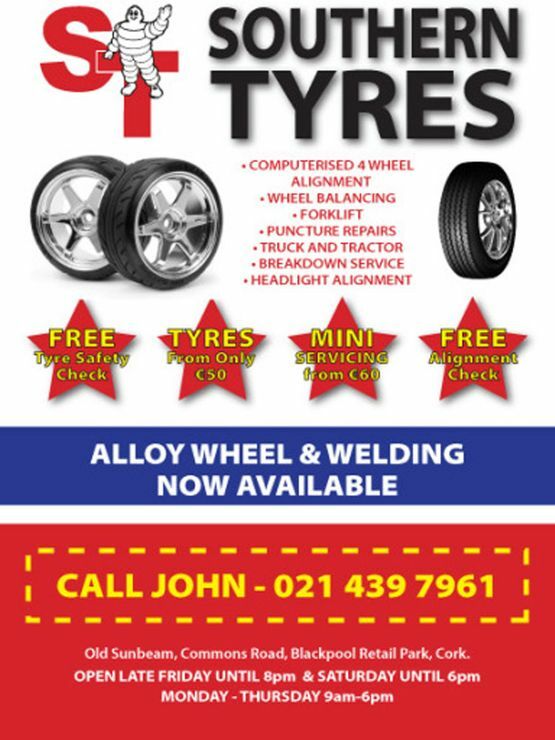 Alloy Wheel Repair & Welding Now Available. We have just introduced the new service of Alloy Straightening, Alloy Welding & Repair. Contact our offices for a quote on any of our services.